A sidewalk along Bellefontaine Road in Bellefontaine Neighbors doesn't quite make it to the Metro bus stop. Germany native Liane Constantine and has lived in a half-dozen other countries, including Japan, India, South Korea, the Netherlands and, for the last four years, the U.S. Her experience in the United States has been an adjustment, she said, where going even short distances is just simpler and safer in cars due to the priority they’ve been given in suburban public spaces. Auto-centric street design has divided where people live from the rest of community life for nearly 70 years, according to St. Louis County Planning Director Justin Carney. Click here to listen to Joseph Leahy's audio feature. Municipal zoning ordinances since the end of WWII most often dictated minimum lot sizes and excluded any development other than single-family homes, Carney said, segregating dwellings from other elements of communities like coffee shops, theaters or martial arts studios. “As the county developed through the ’50s and ’60s and ’70s, it was very car-oriented. The land use pattern, the emphasis wasn’t on walkability. It was on separating those uses,” he said. The term “walkability” is a measure of how easy it is for residents to walk to basic necessities such as grocery stores, parks, doctors’ offices or libraries. In addition to sidewalks and crosswalks, other factors determining walkability include access to public transit, building accessibility and public safety. The term is also a measure of how comfortable and interesting the walk is for pedestrians. Still, some areas of the county, especially older communities, are pretty good for walkability, said Carney. “You see that in the Maplewoods, and the Shrewsburys. You see that in downtown Kirkwood as an existing community. You see that in Overland that has a very downtown, mainstreet sort of segment” he said. 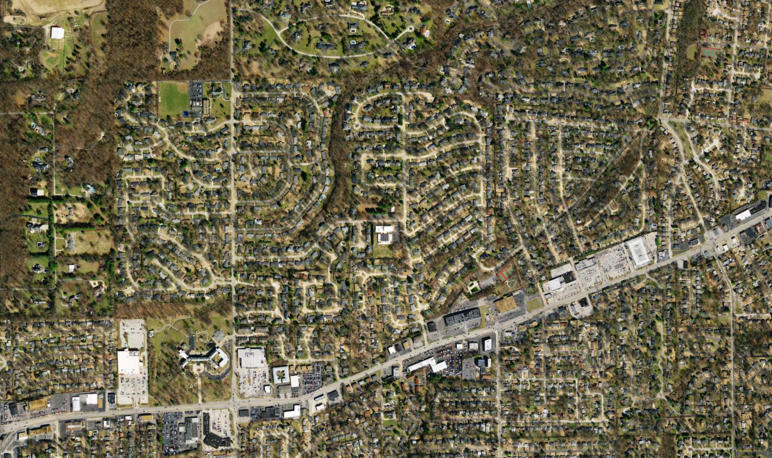 An aerial view of Warson Woods in St. Louis County. But on whole, the hodgepodge of zoning and land-use ordinances among the county’s 90 municipalities have complicated efforts to improve the sidewalk situation, he said. Addressing where the sidewalk ends also depends on figuring out who has jurisdiction on a particular street. Marielle Brown, director of policy and strategy for Trailnet, a local nonprofit that works to boost foot and bike traffic, said what’s lacking in pedestrian infrastructure is often rooted in the limits of the municipality or the county or whoever owns the road. “So maybe you’re in Maplewood. Not all the roads in Maplewood are owned by Maplewood. Some of them are owned by the county and then some of them are owned by MoDOT (Missouri Department of Transportation). So there might be different design standards, or maintenance standards or different budgets ...,” she said. 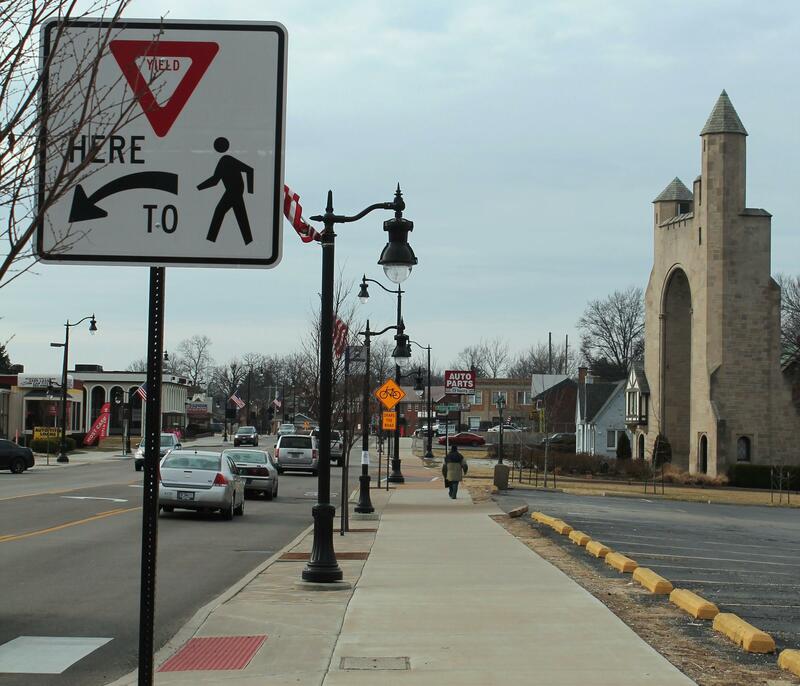 In response to its walkability issues, St. Louis County in 2013 adopted the Great Streets Initiative, an effort introduced years earlier by the East-West Gateway Council of Governments. According to East-West Gateway’s website, the initiative takes a collaborative approach to prioritize planning and resources for greater walkability. “Rather than viewing a roadway project as solely a way to move more cars and trucks faster, the goal of the St. Louis Great Streets Initiative is to trigger economic and social benefits by centering communities around interesting, lively and attractive streets that serve all modes of transportation,” the site says. One of the effort’s recent examples is Natural Bridge Road in Normandy, which reduced lanes for cars, widened sidewalks and improved landscaping and lighting. The Natural Bridge Great Streets project between Lucas-Hunt and North Hanley roads in Normandy wrapped up in 2016 and was designed to calm traffic and improve access to other transportation options such as cycling, walking and mass transit. But Carney and Brown both agree that retrofitting streets for pedestrians is not always the solution in areas where driving dominates. In many places, the scale of a road is too vast and population density is too low, Carney said. “You’re not just going to put bike lanes everywhere for the sake of having bike lanes. You’re not just going to put sidewalks everywhere. It’s incumbent upon us to look at where does it make sense? Where do we have some of — we like to say, ‘This community has some bones we can build on.’ Certainly, running sidewalks along long stretches in a very suburban context may not be appropriate,” he said. Brown adds that an even bigger challenge involves changing attitudes about where we live. 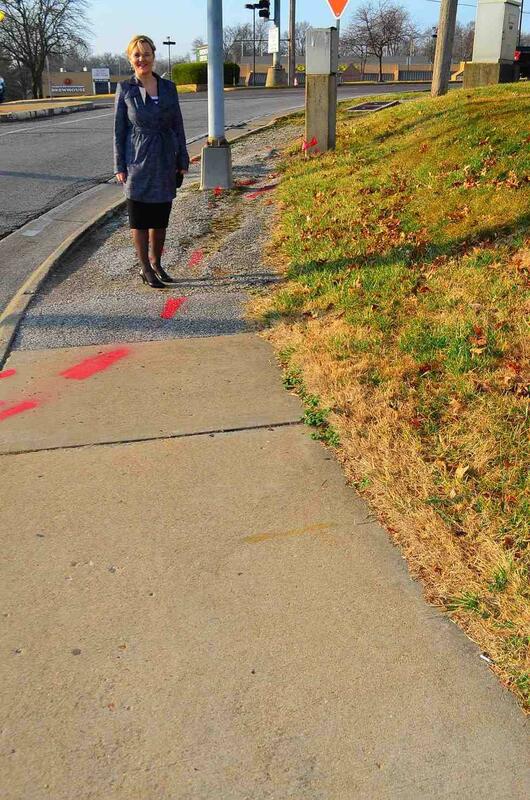 “It’s just important that we start thinking about our streets as public places, as places that people will love and identify as where they belong and not just a car driving through,” she said. The benefits of better walkability on public health, economic growth and community identity are well worth the effort, she said. Plans are moving forward to spruce up West Florissant Avenue, the site of intense protests that followed Michael Brown’s shooting death. Roughly $2.5 million will go toward preliminary engineering on the Dellwood and Ferguson portions of the street. The ultimate aim is to incorporate pedestrian friendly elements – such as new sidewalks and bike lanes – into a 2.6 mile stretch of the road between I-270 and the Buzz Westfall Shopping Center.